As with most things within the firearms industry, training, equipment, and tactics are always evolving. Optics are not immune to these trends. To financially survive in the industry, traditional companies such as Leupold, Burris, and Nikon have tried to stay on top of these growing trends. Yet with new training concepts and the ever-changing face of combat, firearms companies have started developing an edge in producing their own optics. Using the feedback gathered from end users of their rifles and handguns, the manufacturers have started to build optics based specifically on these new unique needs. For years, the multi-power optic had been the king of rifle optics until the 1x red dot began to take over in the late 90s. The primary cause of this was twofold. The first was a shift from the long-range hunting calibers of the traditional bolt action rifle such as 30-06, .308 and .270 to lighter recoiling semi-auto rifles chambered .223, .300 BLK and 6.8 SPC. Secondly, the purpose of a rifle shifted from primarily hunting to close range civilian defensive training, thus moving from rifles such as the Remington 700 bolt action to the AR-15 platform. The red dot offered quick target acquisition and decent accuracy in a fast handling, durable optic. As time went on, shooters began to realize the need to push their close quarter skills out to distances of 100 and even 200 yards out. At these ranges, shooters started to miss having the vision advantage of a traditional multi-power optic. Firearm optics manufacturers began to research this need and design purpose built, lightweight, medium range optics specifically for the shooters requirements. 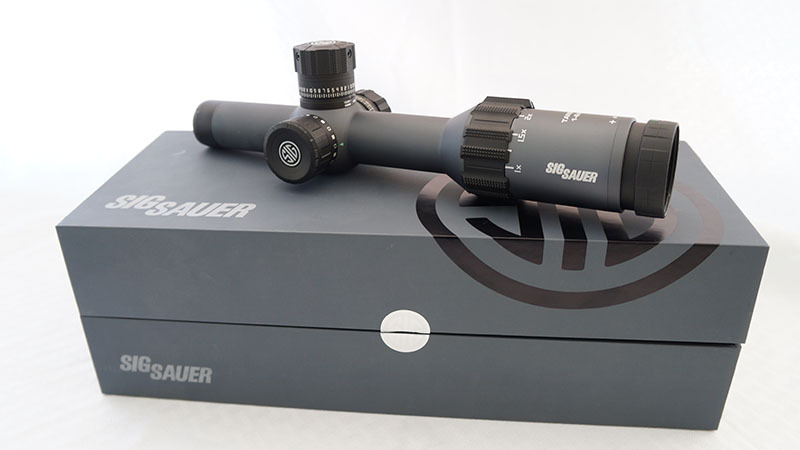 For a company, such as SIG Sauer, developing optics such as these would only add to their already stellar reputation in the industry for superior accuracy, quality and design. Being a longtime admirer of SIG Sauer’s top notch products, I jumped at the chance to try out one of their new battle ready optics. 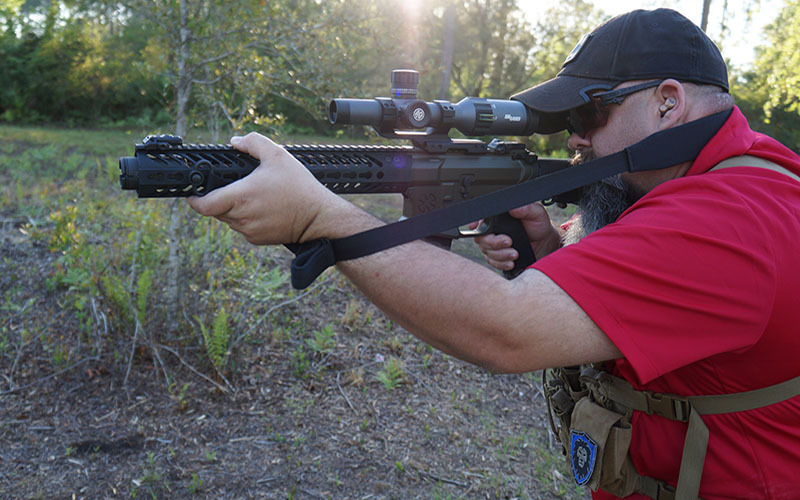 This week, I report in on SIG’s bestselling tactical optic, the SIG Sauer Tango 6 1-6×24 FFP adjustable optic. There’s no secret that one of the main goals for SIG Sauer is to become a shooter’s “one-stop-shop” for all their firearms, firearms accessories, optics and even ammunition needs. 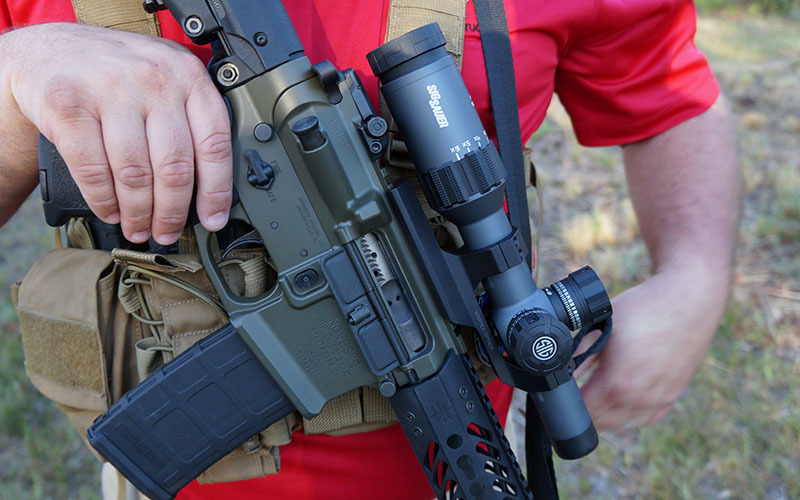 The new SIG line of optics is perhaps their best venture yet with their efforts spent to develop top quality military grade products for the shooting community. When the Tango 6 arrived at my office, I was impressed with its heft out of the box. The Tango 6 was heavier than much cheaper optics we have recently reviewed, but not at all in a bad way. When you hold the Sig optic in your hand, you get the feeling of a well-built tool for serious shooting. According to Sig, this optic was specifically built around the AR platform as the ideal solution for close quarter to mid-range target engagements. The optic sample I received for review came as the SOT61003 model featuring a MOA reticle. Other models offer optional reticles such as MRAD, 3Gun, Hellfire Triplex and Horsedot to cater to shooters specific preferences. The optic featured an adjustable 1 to 6 power range with .5 MOA adjustments in elevation and windage. The dual fiber optic enhanced zoom ring helps the shooter quickly see which magnification level the scope is set on. Within the Tango series, not only does magnification and reticle design come in different options, so does the focal plane. The sample sent was the First Focal Plane (FFP) option. For those who are not familiar the advantages of the first focal plane option, your reticle adjusts accordingly as you increase and decrease magnification. This allows for the use of the same holds to be used regardless of magnification power unlike the more common, yet normally slightly more affordable second plane reticle also available in the Tango series. For the avid shooter who carefully studies their hold overs and dial ups, the First Focal Plane is a huge plus! Another key feature for the Tango 6 reticle was the electronic-illumination feature located on the end of the parallax knob. It has 9 brightness settings and 2 Night Vision settings, and each click between marked brightness settings is an “off” setting. This saves the user time in switching directly to the preferred brightness setting without having to go around the dial and back again to turn the optic “on” and “off.” What may seem like a simple added feature, I can speak from my years of Law Enforcement experience, this time saving, quick adjustment option can possibly mean the difference between life or death. 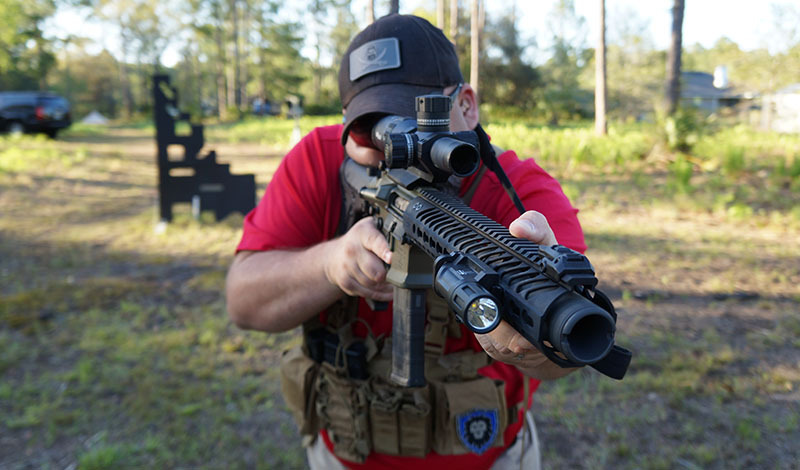 The Tango 6 optic also includes SIG’s MOTAC (Motion Activated Illumination) a feature which powers up the optic when it senses motion and powers down after 2 minutes when there is no motion detected. This feature provides for optimum operational safety and enhanced battery life to keep the end user in the fight longer without worry of running out of battery power in low light. If you’re like me, Murphy’s Law often dictates anything with batteries commonly dying on me at the worst possible time. With the MOTAC feature, it may buy the end user more time between having to change out batteries at an inopportune time. Additionally, the Tango 6’s extra-low dispersion glass (LD) combined with high transmittance glass (HT) provide industry leading light transmission and optical clarity help avoid possibly sticky low light situations. MSRP: $1799.99 (1800GunsAndAmmo.com price $1499.99 (Subject to Change). For testing purposes, I needed a solid, trustworthy mount to attach the Sig Tango 6 on my AR15 chambered in 5.56mm. I decided to go with a Vortex one piece 30mm mount built by American Defense MFG, LLC. Having used these mounts for over 5 years now, they have proven to be strong and reliable platforms to get the most out of high end optics. Retailing for around $179.99, American Defense mounts are always a sound investment regardless if you are using a red dot or long range optic. Once the Tango 6 was mounted, it was time to hit the range for some rifle training at “The Swamp.” Starting at 50 yards, it took very little time to zero the optic using the oversized adjustment knobs. With most close to mid-range optics, I regularly choose to set my zero at 50 yards for better performance at 200 yards and further. This is a great multi-purpose zero if you train yourself to keep in mind the hold over at extreme close range due to height over bore offset. SIG offers an additional option of load / caliber specific customized turrets known as SIG Ballistic Turrets (SBT) for an additional fee. On my sample optic, the standard Lockdown elevation and windage turrets worked just fine. Once I obtained my optic zero, loosening the small hex screws and setting the turrets to the numerical zero was a breeze. The SIG turrets also offer the ability to fully disassemble the turrets a set further and set a stop at your zero for both height and windage as well. I then set up targets ranging from 7 yards to 100 yards across the training grounds in various stages. Moving from stage to stage, I used the Tango 6 to engage each target with two shots each. Switching from 1x to 6x with the zoom ring was fast and easy on the move and really provided a strong advantage over a standard red dot. Even in the bright Florida sun, the reticle was extremely clear and easy to see the red illumination without having to crank it to the full power. The parallax and eye focus rings keep the targets crisp and clear even for braced precise head shots on target at 100 yards. After a brief down period to reload magazines and catch a water break, I was fully recovered from the series of running multiple stages for video and photos. I then proceeded to set up a reduced size torso AR500 Steel Veterans target at 200 yards to work on prone shooting. At 6 x magnification, the target was crisp and easy to engage with centered shots holding approximately 2 inches low. I managed to hold less than a 2-inch grouping using an assortment of duty grade 5.56mm ammunition which is more than good enough for government work! One feature I quickly became very impressed by with the Tango 6 optic was the large ocular lens. 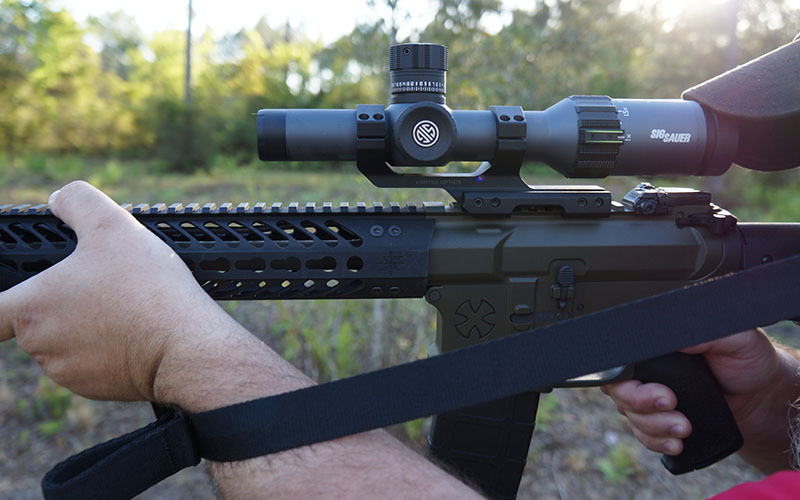 The SIG optic offers a rear lens larger than most red dot optics with a VERY forgiving eye relief which allows the shooter to acquire the reticle quickly from low ready or on the move. I have often developed headaches from using magnified optics over long periods of time, but having ran the Tango 6 for multiple hours over several range training sessions, I can report this was never the case with SIG’s new product. When using my AR15 for longer range targets and then transitioning on the fly to a pistol for extreme short range targets, the Tango 6 was regularly bouncing off my gear when quickly slung to the side out of the way. While I am not abusive to my gear, I do use it hard for real world training. Moving from day to day between range trips, I checked the optics zero each day before getting started. I found over the multiple day testing period not a single click of lost zero. This optic proved to be tough and reliable from drill after drill regardless it was up close and personal or pinging steel on the wood line 200 yards away. During testing the Tango 6 with close quarter combat drills using AR500 steel targets, I felt flak from rebounding lead off the target surfaces strike the optic on 3 or 4 occasions during rapid fire. Other than a couple of small scratches on the side of the optic’s body housing, the Tango 6 was in perfect working order. This lead me to wanting to mention SIG’s warranty policy in regards to their optics. SIG states they will repair or replace your SIG SAUER product in the event it becomes damaged or defective, at no charge. If SIG cannot repair your product, they will replace it with a product in perfect working order of equal or better physical condition. It doesn’t matter how it happened, whose fault it was, or where you purchased it. I would say that’s a pretty fair offer as far as warranties go! As my time with the SIG Optics Tango 6 went on, I came to really enjoy using it. The controls were all straight forward and easy to use, the glass was crisp and sharp and the reticle offered everything I have come to want in a close quarter to mid-range optic. 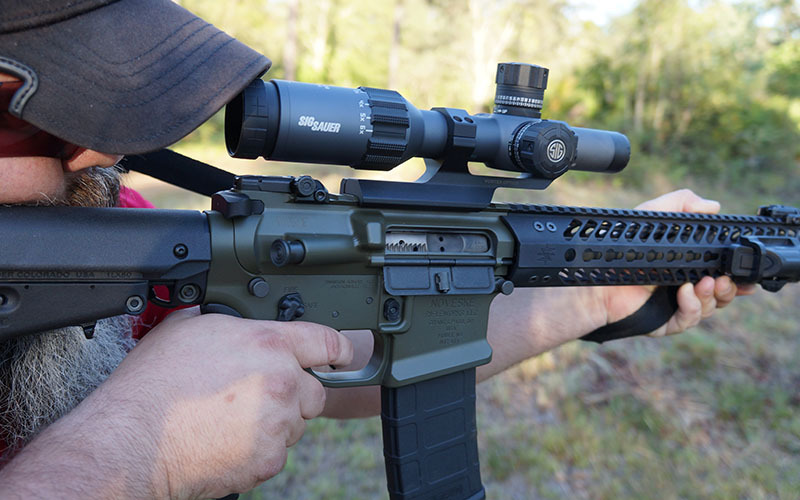 Unlike cheaper made scopes, the SIG Tango 6’s construction is rock solid and able to withstand the rigors of combat, patrol duty or even the home owner refusing to be a victim. With a retail price of $1799.99, SIG offers a lot of solid quality features for the money. As a huge fan of the Vortex Razor JM-1 1-6x24mm optic, the SIG Tango 6 is the only product I have found in the industry where both the price and the quality categories can directly compete successfully. 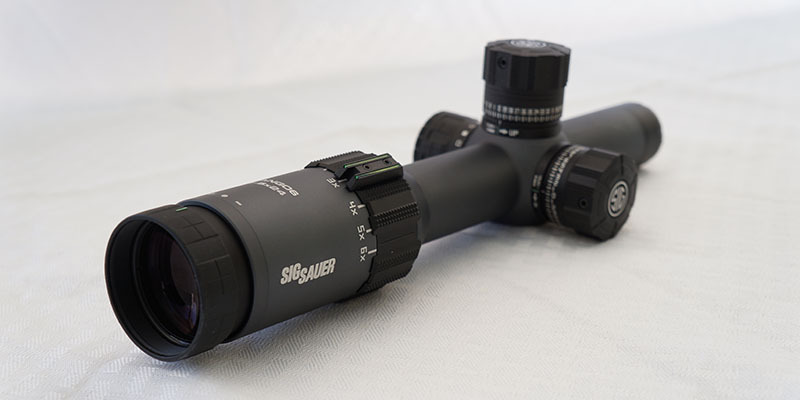 For a company like SIG Sauer who is widely diversified into handguns, rifles, binoculars, optics, and ammunition, the Tango 6 is a great representation of their ability to do it all in the industry. The SIG’s reasonable prices for top quality products combined with their new Infinite lifetime guarantee makes this company hard to ignore as a leading prospect for all things shooting related. If you are currently in the market for a close quarter to mid-range optic, I highly recommend giving the SIG Optics Tango 6 a try.